SRINAGAR: A Pakistani militant belonging to Lashkar-e-Toiba (LeT) outfit who was tasked with reviving militancy in certain areas of the Kashmir Valley was arrested from Baramulla district of Jammu and Kashmir, police said here on Wednesday. A Pakistani militant belonging to Lashkar-e-Toiba (LeT) outfit who was tasked with reviving militancy in certain areas of the Kashmir Valley was arrested from Baramulla district of Jammu and Kashmir, police said here on Wednesday. Awan, known by alias of ‘Chota Dujana’, told reporters that before he joined militancy, he was told that atrocities were being committed on the people of Kashmir by security forces but he saw no such thing in the Valley. “I received training for four months at a camp in Muzaffarabad. I was told that atrocities are committed on children and women. Prayers are not allowed in mosques and houses of Muslims are destroyed,” he told reporters, adding he found that the conditions were different in Kashmir. Police officials said Awan’s arrest and “confession” is a “live evidence” for Pakistan as to how youths are manipulated on its soil, prepared for militancy and then sent here to join Jaish-e-Mohammad or Lashkar-e-Toiba. The Senior Superintendent of Police (SSP) of Baramulla, Abdul Qayoom, said Awan had infiltrated in the valley in July 2017. “He was active in Handwara (area of north Kashmir’s Kupwara district). For the last about two years, he was active in different places of Srinagar. When he was returning to Baramulla, he was intercepted at a naka (check post). However, the driver of his vehicle rammed it into police vehicle and sped away. “The police chased them and about 1.5 km away from the naka, they left their vehicle on the road and tried to flee, but were apprehended. The driver, a conduit, is a Kashmiri. We will share further details when we have them,” the SSP said at the press conference. Qayoom said Awan’s primary task was to revive militancy in those areas which had been declared militancy-free. “We had this input that since Baramulla was declared free of militancy, they (militant leadership) were under pressure to revive the militancy there and that is why these two were going to Baramulla,” he said. He said a pistol and some other things were recovered from the Pakistani militant when he was arrested. Asked about Awan’s activities in Srinagar, the SSP said he mostly visited areas around Srinagar-Baramulla highway and few areas in downtown – the interior areas of the city here. “We are identifying and pinpointing more people involved with him,” Qayoom said. Director General of Jammu and Kashmir Police Dilbag Singh, who also briefed the media, said Awan’s “confession” is evidence of how Pakistan is sending youths here for militancy. “Pakistan always wants some live evidence. Police will share that evidence. A Pakistani militant is here since the last two years and an active member of LeT and involved in many activities. NEW DELHI: A Delhi court sent JKLF chief Yasin Malik, arrested in a case related to funding of separatists and terror groups in Jammu and Kashmir, to judicial custody till May 24. NEW DELHI: At least 10 militants, who had crossed over to Pakistan, set up businesses across the border with the active aid of ISI and were involved in the recently suspended cross LoC trade to provide funds to terrorists and separatists in Jammu and Kashmir, officials said. ANANTNAG: Amid scepticism over the conduct of elections, an overall peaceful polling was marked by a low turnout of 13.63 per cent as compared to 40.21 per cent in 2014 in this district, part of the Anantnag parliamentary constituency. ANANTNAG: The poll boycott call and upsurge in militancy seemed to have played a part in a steep fall in the turnout in the Anantnag district of south Kashmir, which went to the polls on Tuesday. SRINAGAR: The home turf of former Jammu and Kashmir Chief Minister Mehbooba Mufti, the Bijbehara Assembly segment under the Anantnag Lok Sabha seat, reported highest concentration of polling stations where zero votes were cast. JAMMU: Amid protests by migrant voters over missing names in the election list, 59 per cent of the displaced Kashmiri Hindus exercised their franchise for the first phase of polling in Anantnag parliamentary constituency at special polling stations in Jammu. KOKERNAG: Masarat, the woman presiding officer of a polling station in Bindoo Zalangam village of the Kokernag area in south Kashmir, is busy making an elderly villager understand that he cannot vote on behalf of his mother, who he claims cannot travel to the polling booth because of a fractured limb. JAMMU: Displaced Kashmiri migrants have come under sharp criticism for allegedly evincing no interest in casting their votes for three parliamentary seats of Kashmir Valley owing to the “cumbersome” procedure for filling the M-forms. JAMMU: Congress leader Thukjey Dolma on Tuesday joined the BJP in the Ladakh region of Jammu and Kashmir, just a fortnight ahead of the Lok Sabha elections in the constituency, a party spokesperson said. SRINAGAR: Normal life remained affected due to a shutdown called by the separatists against alleged ill-treatment of senior JKLF chairman Yasin Malik. SRINAGAR: A policeman on poll duty was killed and 14 others, including eight securitymen, were injured when the vehicle they were travelling in met with an accident in Anantnag district. JAMMU: The Navodaya Vidyalaya Samiti has sanctioned special maintenance and repair works in various Jawahar Navodaya Vidyalayas of the state. JAMMU: The Committee for Fixation of Fee Structure of Private Educational Institutions, J&K, has regulated the fee structure of more than 500 private schools of Jammu division. JAMMU: Farmers in Jammu are harvesting their wheat crop early as the weathermen have predicted a fresh spell of rains in the region due to western disturbances. JAMMU:All IAS officers in the state have been directed to file their immovable property returns (IPRs) electronically. NEW DELHI: Nayeem Geelani, son of separatist leader Syed Ali Shah Geelani, appeared before the National Investigation Agency for questioning in a case related to funding of terror groups and separatist organisations in Jammu and Kashmir, officials said here. RAJOURI:Two persons, including a cop, were electrocuted, while six were injured at their homes when high voltage was reported at their houses allegedly due to some technical snag. RAJOURI: A Manjakot police team, led by SSP, Rajouri, Yougal Manhas on Tuesday arrested a policeman and booked several others for allegedly duping investors on the pretext of doubling money in a short period. SRINAGAR: The driver of a vehicle carrying ITBP troops back from their poll duty in Kokarnag area of south Kashmir was killed as it overturned after a mob hurled stones at it, officials said here. NEW DELHI: Nayeem Geelani, the son of pro-Pakistan separatist leader Syed Ali Shah Geelani, appeared before the National Investigation Agency for questioning in connection with a case related to funding of militant and separatist groups in Jammu and Kashmir, officials said here. SRINAGAR: Voting began on a dull note in Anantnag district of Anantnag Lok Sabha constituency, where polling will be held in three legs, amidst tight security measures. 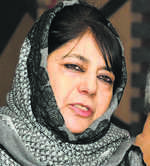 ANANTNAG: Reacting to Prime Minister Narendra Modi’s remarks that India has not kept its “nuclear bombs for celebrating Diwali”, Peoples Democratic Party president Mehbooba Mufti today said even Pakistan has not kept its nuclear weapons for Eid. SRINAGAR: A day ahead of poll in south Kashmir, security forces arrested a suspected Pakistani militant of Lashkar-e-Toiba in north Kashmir’s Baramulla district. JAMMU: The Dogra Group of Colleges, Bari Brahmana, on Monday organised a poster-making competition to mark Earth Day. The theme was “Protect your species”. RAJOURI: A two-week workshop on faculty development programme on machine learning began at Baba Ghulam Shah Badshah University (BGSBU) on Monday. JAMMU: The Directorate of School Education Jammu (DSEJ) has requested the Deputy Commissioners (DCs) of all 10 districts of the Jammu region to support it in taking a stern action against the private schools for raising fee without the prior permission of the Fee Fixation Committee (FFC). Lt Gen DS Hooda’s (retd) document “India’s national security strategy” is half-baked — it hides problems more than highlighting those that plague Kashmir as “India’s biggest internal security challenge”. JAMMU: The Central Government Pensioners’ Welfare Association (CGPWA), J&K, Jammu, held its 24th annual general body meeting to discuss important issues relating to the pensioners, their welfare and health facilities. SRINAGAR: A day after a sports event turned into a violent protest at the University of Kashmir (KU), the State Sports Council has come under fire from the government as it had not obtained required permission from different departments in the administration for holding the event in which 10,000 schoolchildren were invited. JAMMU: While Earth Day is being celebrated across the world today to demonstrate support for environmental protection, a look at Tawi River, also known as Suryaputri, presents a picture of neglect. SRINAGAR: The police on Monday launched investigation into an incident of fire in a truck carrying scrap material in the Qazigund area of south Kashmir following reports claiming that a large amount of cash was being transported in the vehicle to the poll-bound Anantnag Lok Sabha constituency. DODA: Nearly a dozen houses were damaged in Doda district on Monday after a massive landslide. The incident took place around 60 km from the district headquarters at Tensa village of Kahra-Gandoh at 9 am when a massive landslide hit the area. SRINAGAR: Separatist leaders have called for a shutdown across the Kashmir valley on Tuesday to express solidarity with JKLF chief Yasin Malik, whose family has recently claimed that he is ailing in NIA custody. DODA: Kishtwar District Election Officer (DEO) Angrez Singh Rana has suspended a teacher and disengaged a daily rated worker for violations of the model code of conduct. JAMMU: The cross-Line of Control (LoC) trade, which was suspended by the Ministry of Home Affairs (MHA) because of its misuse for terror funneling purposes, will resume soon after the mechanisms to check the loopholes are put in place. JAMMU: Ladakh, the country’s geographically largest parliamentary seat, on Monday finally set for a quadrilateral contest after one of the five candidates withdrew his nomination papers on the last day of withdrawal. BIJBEHARA: Of the six Assembly segments in Anantnag district going to polls in the first leg of the three-phased Lok Sabha elections on Tuesday, Bijbehara, the hometown of the Muftis, may not bring the desired results for them this time. SRINAGAR: PDP president Mehbooba Mufti on Monday hit out at Prime Minister Narendra Modi for bringing nuclear bombs in the political discourse, saying if India has not kept the nuclear bomb for Diwali, Pakistan has not kept its for Eid. DODA: A dozen houses were damaged in a landslide in Jammu and Kashmir’s Doda district on Monday, officials said. SRINAGAR: Traders affected by the suspension of cross-LoC trade by the Centre held a protest march here in the summer capital of Jammu and Kashmir on Monday. SRINAGAR: A truck carrying currency notes caught fire on Monday in Anantnag district. 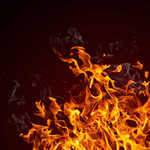 Police sources said the truck caught fire in the Qazigund area on the Jammu-Srinagar national highway. JAMMU: As the parliamentary elections on the two Jammu seats are over, speculation over the likely winners have become the talk of the region. 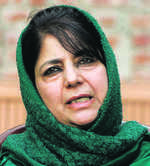 KASHMIR: “My workers are the real mujahideen (warriors),” Mehbooba Mufti had thundered. Now she is leading her own campaign in Kashmir as a lone warrior, fighting for survival where she had stood almost unchallenged for more than two decades. JAMMU: With the onset of the summer season, “Beating the Retreat Ceremony” was conducted at the Hall of Fame in Leh to pay homage to the martyrs.